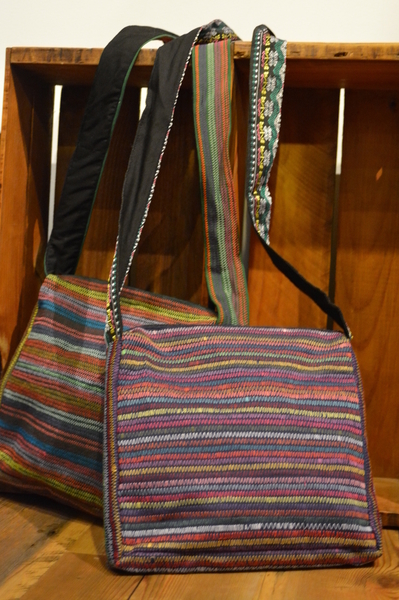 These magnificent, colourful and functional shoulder bags are hand made by the women of a Lisu Hill Tribe village located in an isolated area of northern Thailand. These women have been vulnerable to exploitation for many years. Their business initiatives, product development and mentoring from the Life Development Centre is enabling these women to create a secure community for themselves and their children. With the profits made from the sale of each bag, these women have built a community centre in their village and contribute daily to the development of positive village life. Life Development Centre is staffed by Thai volunteers and committed to helping create a secure future for girls vulnerable to exploitation. Each bag is unique in colour detail whilst showcasing traditonal Lisu craftmanship. The fabric of each bag is made within the community and is completely washable. Each bag is fully lined with black cotton fabric. These shoulder bags can vary slightly to those pictured as each piece of fabric is hand made and each bag is individually completed. Each bag is approximately 22cm long x 22cm high x 3cm deep and has a zip closure. The strap is long enough to wear accross the body: 122 cm total loop. At the moment, we have sold out of the grey/green base fabric bag in this design.